The Gunslinger is the rogue, the bandit, the very picture of a world where the only law is the law of the gun and the difference between survival and defeat is a single well placed bullet. The Gunslinger subclass is the ideal path for the exploratory Hunter, eliminating enemies with a precision that only comes from hard fought experience. An explosive grenade that sets enemies on fire, causing additional damage to them. This is a textbook grenade, with the initial explosion often being enough to kill them depending on how close it is to them. On top of this the additional fire damage over time can be quite useful to push both enemy Guardians and minions of the Darkness over the edge into a complete and utter fiery end. This grenade is generally used as a one stop shot, in that it is at its most useful capacity when at a closer range to your target. However they can be quite easy to avoid particular in PVP and so may not be the most ideal choice for a serious player. In a PVE arena however, the ability to create a large explosion can be quite beneficial in clearing out large groups of adds. A grenade that explodes on impact, releasing multiple drones that seek out nearby enemies. This grenade is more of a utility in a PVE context as it lacks the immediate damage output to be a powerful addition to a Gunslingers armament in the Crucible. That being said, if all of the Swarm grenade drones manage to hit a target or if the target is damaged before or even after the detonation of the grenade, it could quite easily become a powerhouse in its own right. The initial explosion of the Swarm grenade does some minor damage but the bulk of the harm is done by the seeker drones. As stated before, this grenade will probably see more use in a PVE environment as a large portion of the seeker drones need to connect with a target in order to achieve a kill. On the positive end, this grenade allows for enemies to be targeted behind cover which is always useful. An explosive grenade that sticks to surfaces and detonates when enemies pass through its laser trigger. This is the go to grenade for most Gunslingers in a PVP scenario. This grenade has a high damage output and is often enough to eliminate most enemies outright. The Tripmine is a sticky grenade that can attach to any surface, such as walls and even ceilings which makes it ideal for locking down areas as most grenades do. The appeal of this grenade is the fact that it can remain in one location for a fair amount of time and as such kill enemies long after you have left an area. The laser trigger has a large radius and can detect enemies running, sliding or jumping past it, at which point it explodes dealing a huge amount of damage in a cone like formation. The further away from the Tripmine an enemy is, the less damage it does. However a note of caution for everyone who uses it, your own Tripmine grenade can become deadly if you are too close to it when it explodes, as the detonation is kind to no one. -Circle of Life : Killing and enemy with a throwing knife while Golden Gun is active extends the duration of Golden Gun. Deadeye : Significantly increases the accuracy of Golden Gun. This perk is important and quite ideal for making every shot count. However in both a PVE and PVP scenario, this perk may not see much use due to the lack of difficulty in aiming and firing a Golden Gun shot. However, saying that it can assist in those longer range Golden Gun kills that probably will evade you without the use of this ability perk. 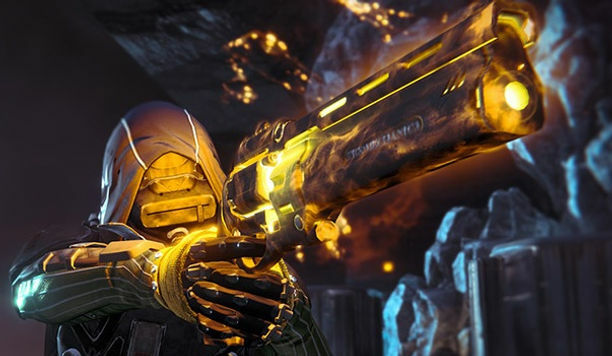 Combustion : Killing enemies with Golden Gun causes them to explode after one second. This perk can come in quite handy for add control and to score some extra kills in the Crucible due to some poor fool standing a little too close to your target. As someone who has been on the giving and receiving end of this skill, the ability to make your marks not only disintegrate but also explode is not only a scare factor that will reduce your enemies into running pillars with targets on their backs but also assist in clearing out any of their nearby allies. Gunfighter : Reduces the cooldown of Golden Gun allowing it to be used more often. This perk speaks for itself in a fairly direct way. Having a reduced cooldown with your Golden Gun leads to achieving your Super more often and scoring a lot more kills. There are a great amount of miscellaneous perks to choose from that will alter the way your Gunslinger strides into battle with their gun at their hip and their aim everlasting and true. It all depends on how your playstyle interacts with the Destiny world and they are divided up into physical and ability attributes.